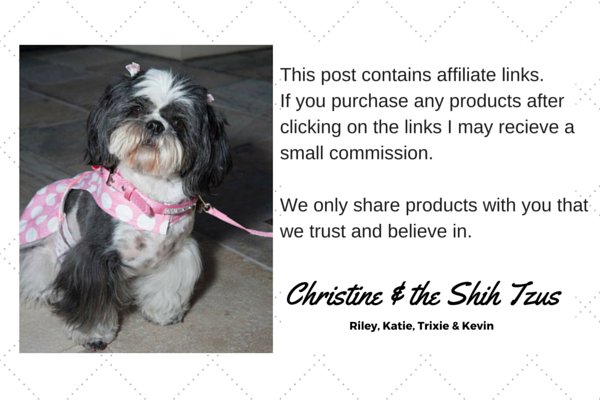 This post contains affiliate links for ease of ordering some of our favorite products. 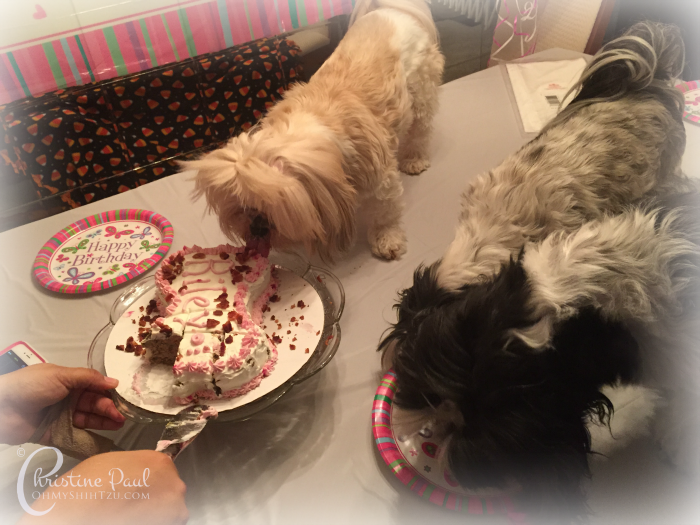 January 17 was Riley’s birthday so we decided to celebrate and throw a Shih Tzu Birthday Party . I made it my quest to find a yummy natural dog birthday cake for the special event. Initially I thought of purchasing a cake, but with prices in the range of $40 – $50 that was out of the question. I knew a DIY dog birthday cake would be in order. 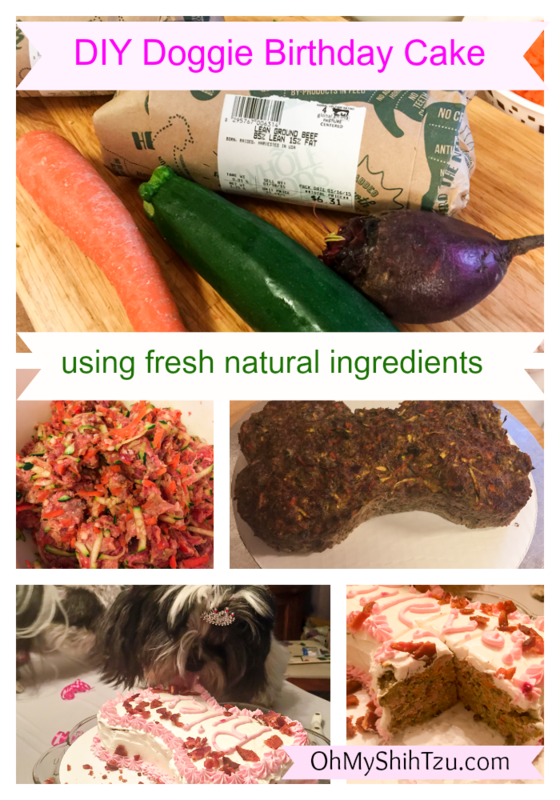 My girls eat a raw diet, so I really wanted to stay close to their normal diet as much as possible, so their cake included a yummy blend of lamb, beef and The Honest Kitchen Hale base mix, along with fresh veggies. I did purchase all ingredients at Whole Foods with the exception of THK Hale base mix, as the Hale is a part of our everyday feeding, and kept the price under $25.00. This price could be lower if you changed the lamb with another meat of your choice, either ground chicken or turkey. This recipe is very easy to adjust so you can include veggies that are currently in season in your area, or ones that your dog may prefer. Since there isn’t any type of wheat or flour in this recipe it is very dense, so a small slice can go a long way. This is yummy cake is a fun take on meatloaf. Bake for 50 minutes, remove from oven and drain excess liquid with baster. Allow to cool completely in silicon pan before removing for frosting. Combine cream cheese and yogurt and mix into a creamy mixture. Spread remaining white mixture on cake. With remaining 1/2 cup add one slice of beet to mixture, pressing beet will release color into cheese mixture, keep pressing beet to achieve desired color. If your oven is over 5 years old I recommend using an oven thermometer to achieve correct temperature. I actually used my Breville toaster oven to bake this cake . 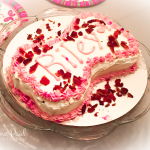 I found this a very easy cake to make, but what I think made it even better was its bone shape. I purchased the K9Cakery Silicone Cake Pan, 7-Inch by 10-Inch, Small , which fit perfectly in my Breville Toaster Oven. The girls went crazy about this cake! Even Trixie who never guards her food wouldn’t let me help her when it spilled out of the plate. It was that good!!! The girls bite into their birthday cake. Have you ever made a cake for your dog’s birthday? If so, how did it turn out? « A Tribute to Martin Luther King Jr. Healthy AND clever! Your dogs are lucky to have you as a Mom. I have definitely seen meat based cakes before, but I love this idea for frosting! Bookmarking for later!! That is so creative. I loved this post. What a great concept. Happy Birthday Riley! I had been looking forward to your sharing this recipe!! I will most definitely give it a try ~ it just looks so awesome! Barbara Rivers recently posted…Boxing Puppies ~ Monday Mischief!